Howard Webb provided this black and white Bell's Series postcard of the Post Office dating from 1908/10. Benjamin Maddern Harris was the Postmaster in Kelly's Ealing, Acton, Hanwell, Brentford, Gunnersbury and Chiswick Directory ("Buff Book") for 1911. He lived at 8 Whitestile Road in 1911, his son Reginald Benjamin Harris, age 31, was a Post Office Clerk. He does not appear in the photo, but 6 young male post office workers do. The Post Office was built on open ground next to St Paul's Church in 1908. Previous Post Office sites include 110 High Street, 127 High Street, 327 High Street, 390 High Street. More recently 102 High Street was Brentford's main PO. A 1925 map of Brentford also shows a Post Office on the eastern side of Market Place. See 'Brentford Past' by Gillian Clegg for more about the history of postal deliveries in Brentford. 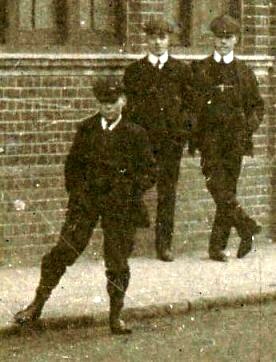 Howard provided a high resolution scan which provides details of the post boys: enlargements showing five of the six are below (the boy far left was not so clear and is not included). They all look under 18 and I hoped to find them in the 1911 census: but although findmypast website allows searches by occupation, a search for occupation with no forename or surname was too much for it. But if you happen to have a postal worker in your family, born mid 1890s and living in Brentford, he may be captured on this postcard. These boys were age 20 or over in 1908, the earliest date the photo could be. 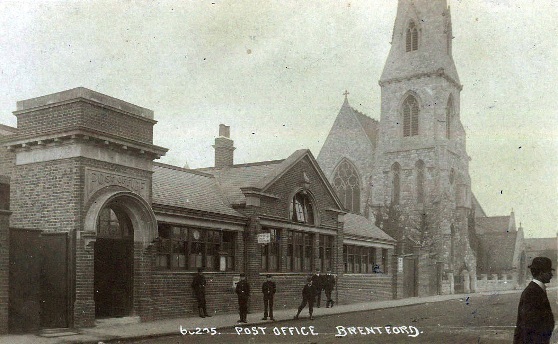 'Archive Photo Series Brentford' (Carolyn & Peter Hammond) includes a Post Office staff photo taken outside their previous Market Place site in 1904 (page 61). 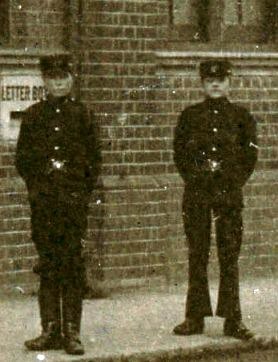 Seven small boys wearing the same uniform as the two in the photo below left are identified as 'telegraph boys'.